In the first pAsuram, parAnguSa nAyaki is informing that she desires to go to thenthiruppErai due to the suffering she is going through, which is beyond words, to her mother who is enquiring about her state. Subsequently, parAnguSa nAyaki is telling her determination to go to thenthiruppErai where emperumAn resides, due to his manifesting his form with the enjoyable weapons, limbs and periya thiruvadi (garudAzhwAn) in her heart. puLLaik kadAginRa ARRaik kANIr en soillich chollugEn annaimIrgAL! annaimIrgAL – Oh those who try to keep me away from him thinking “we are your mothers [so we know what is good for you]” (without realising my internal emotions which are beyond the expression of words)! kANIr – you don’t know! sollugEn – Will I be able to explain? Oh those who try to keep me away from him thinking “we are your mothers!” emperumAn who is having lotus eyes and holding the white, curly SrI pAnchajanya and the divine chakra, is inside my heart riding periya thiruvadi and you don’t know how he does that! Will I be able explain it through words? emperumAn who is shining in my heart which is having the flood of bliss as a result of experiencing him, is manifesting his greatness in the divine abode, thiruppEreyil; the loud chants of vEdham by those who enjoy such beautiful sitting posture of emperumAn, the sound of the musical instruments etc due to the ever occurring uthsavams and the loud noise of the playing of the group of children, are heard continuously without a break; when will I reach there? veLLaich churi sangodu Azhi Endhi – AzhwAr constantly engages in the beauty of emperumAn‘s divine hand and chakra combination as said in thiruvAimozhi 6.5.1 “thavaLa oN sangu chakkaram” (white coloured radiant conch and chakra), thiruvAimozhi 6.9.1 “kUrAr Azhi veN sangu” (sharp chakra and white conch), thiruvAimozhi 7.2.1 “sangu chakkarangaL enRu kai kUppum” (she performs anjali saying “Sanka, chakra”). He is known as mugilvaNNan (one who has complexion of cloud); holding the conch which is curly and white, contrasting with the complexion of his divine form, and the beautiful chakra which does not need any additional adjectives. thAmaraik kaNNan – She is reminiscing what is said in thiruvAimozhi 7.2.1 “thAmaraik kaN enRE thaLarum” (becomes tired by just saying “lotus eyes”). Just as his divine shining form is represented by his divine weapons, his glance highlights his internal qualities. Naturally, the compassion in the heart is revealed through the eyes. Just as the eyes appear to be enemies for the unfavourable ones, similar to the divine weapons, for the favourable ones, his divine weapons are seen as adding beauty to his divine form similar to the divine eyes. The favourable ones will enjoy the divine eyes along with the divine weapons and the divine weapons along with the divine eyes. The divine weapons are recited along with the divine eyes to indicate how emperumAn won over her; they will make one say as in jithanthE sthOthram 1 “jithanthE” (victory!). The eyes are recited along with the weapons, to highlight his beauty. Here nanjIyar mercifully used to highlight the words of nilAththukkuRi pagavar [this can be seen in thiruvAimozhi 3.7.2]. Just as the AzhwArs [Sanka, chakra] are ornaments to decorate the hands, the eyes are ornaments for the face. As said in mUnRAm thiruvandhAdhi 1 “thirukkaNdEn ponmEni kaNdEn thigazhum arukkan aNi nirRamum kaNdEn serukkiLarum ponnAzhi kaNdEn purisangam kaikkaNdEn ennAzhi vaNNan pAL inRu” (I had the fortune to worship SrI mahAlakshmi, his beautiful divine form,the beautiful, resplendent radiance shining like a sun from his form, his beautiful divine disc which is bursting out in the battle field and his beautiful divine conch which is curling towards the right), the divine weapons too appear as decoration, along with his physical beauty. As AzhwArs (Sanka and chakra) have decorated his hands, they are known as ornaments. en nenjin UdE – Since it is not in their[mothers’] heart, they will say “this is not acceptable”. en nenjin UdE puLLaik kadAginRa – emperumAn bestowed AzhwAr unblemished knowledge and devotion and made his heart to be said as in thiruvAimozhi 3.8.2 “nenjamE nIL nagar” (considering my heart as a big divine city); while there is sufficient space in paramapadham [which is three times the size of material realm], as he would climb the shoulders of thiruvadi (garudAzhwAr) and ride along to sustain the dwellers of paramapadham, here emperumAn is manifesting the same inside his heart. nenjin UdE – They will say “Would whatever is present inside, be not seen outside as well?” She will say “if he is not present in my heart, I too can be considered as non-existing”. 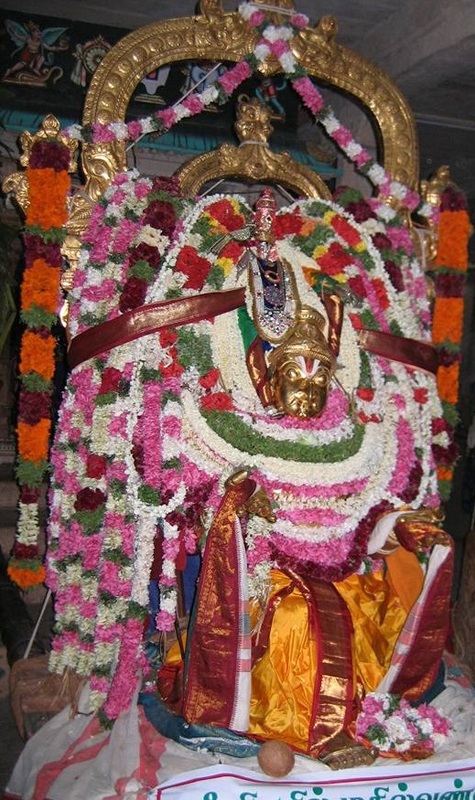 emperumAn is roaming around in parAnguSa nAyaki’s divine heart with the AzhwArs (Sanka, chakra) as hamsa (swan), chakravAga (another bird) on a pond, the divine limbs as fully spread out, blossomed lotus, the divine form which is like the water and lotus leaves in that pond, periya thiruvadi (garudAzhwAr) holding emperumAn as mount mEru holding that pond. This is how emperumAn engages with his dear devotees. nanjIyar was once travelling to kOyil (SrIrangam) and meets piLLAn on the way; nanjIyar asks piLLAn “Does ISvara only have svarUpa vyApthi (pervading everywhere with his subtle antharyAmi form) or does he also have vigraha vyApthi (present in the heart, with a visible antharyAmi form)? piLLAn replied “bhAshyakArar (emperumAnAr) primarily explained svarUpa vyApthi in his commentaries; yet, embAr (disciple of emperumAnAr) told me once ‘I have heard from emperumAnAr once that emperumAn is present with a visible form in the heart of his devotees for their worship’ ” Just as it is said in thaiththirIya AraNyaka “guhAyAm” (one who resides in the cave of mind/heart), katOpanishath “gahvarEshtam purANam” (the ancient person who resides in the mind/heart), periyAzhwAr thirumozhi 5.2.10 “aravaththamaLiyinOdum azhagiya pARkadalOdum aravindhap pAvaiyum thAnum agam padi vandhu pugundhu” (emperumAn entered my heart with his serpent bed, beautiful milky ocean and SrI mahAlakshmi) and SrI rAmAyaNam “EshAm indhIvara SyAmO hrudhayE suprathistitha:” (In whose hearts dark-coloured bhagavAn is firmly present), “en nenjinUdE puLLaik kadAginRa” is also similar to these. In SubhASraya prakaraNams [sections which explain meditation on the auspicious form of emperumAn], as said in muNdaka upanishath 3.2.3 “thasyaisha AthmA vivruNuthE thanUmsvAm” (bhagavAn shows his true form to those who are dear to him), his divine form as the target of meditation is explained; subsequently he presents his form only to them as said in SrI rAmAyaNam yudhdha kANdam 1.13 “Esha sarvasva bhUthasthu” (This embrace of mine is equivalent to everything else). Let the others say whatever they like; but there is nothing greater than this path which is shown by our AzhwArs; even those who [sections of vEdhAntham] say “there is something inside/beyond the [divine] form”, are only speaking about the true nature of bhagavAn; they are not negating the form. puLLaik kadAginRa – garudAzhwAr would eagerly wonder “Are we going to be roaming around inside AzhwAr‘s heart only?” emperumAn would tap him to speed him up saying “Yes! How did you know?” and garudAzhwAr would continue his run inside; [is garudAzhwAr more eager to protect AzhwAr than emperumAn?] as said in SrI rAmAyaNam sundhara kANdam 16.4 “dhImatha:” (one who is conscious, his [it is in context of lakshmaNa being more protective of sIthAp pirAtti, than SrI rAma]), garuda’s duty is to unite the devotees with emperumAn. kadAginRa – [present tense] not recollecting what happened in the past and not talking about future. Is there any specific instruction needed for what is happening now? kANIr – You are not seeing. Even what is happening at present, is not fulfilling the purpose due to your efforts to stop it. Are you not hearing the noise of garudAzhwAr’s flying? It is unfortunate that I have to explain about what is well known. en sollich chollugEn – I cannot explain it; what can I say and which words can I use? Just as it is beyond your vision, it is beyond my speech. It appears that the experience which filled his heart cannot be fitted in to his speech! en sollich chollugEn – I am not speaking due to my weakness; due to his unlimited greatness, we cannot speak about him. I need not speak since you are not going to believe me anyway. annaimIrgAL – If you are like me [like minded], based on what is already known, we can do as said in SrI bhagavath gIthA 10.9 “bOdhayantha: parasparam” (discuss with each other) [but you are much older than I]. en sollich chollugEn annaimIrgAL – I cannot express my anguish through words; you are stopping me in your old ways due to lack of understanding my situation; do I need only those who constantly stop me? They ask “If we don’t have the eyes to see and the ears to hear, what are you planning to do?” She says I am going to the town where those who advice and try to withdraw me from him are not present. This abode [thenthiruppEreyil] is an abode which will not let one think about those [parents, friends etc] who separated as said in chAndhOgya upanishath 8.12.3 “nOpajanam smaran idham SarIram” (AthmA will not contemplate about the material body after reaching the spiritual realm). veLLach chugam avan – One who has a flood of bliss. One who retains the infinite bliss which originated during the union, even during separation. The bliss he gave during union remains even in separation. veLLai – When it is read as “veLLai“, it means faultless bliss [pure bliss, without suffering]. It should be recited as “avan vIRRirundha – thenthiruppEreyil“. This is the opposite to what is said in her case in thiruvAimozhi 7.2.4 “itta kAl itta kaiyaLAy irukkum” (she remains with her leg and hand placed wherever they were). While she is suffering here, he is seated jofyfully manifesting his opulence there. avan vIRRirundha – Being seated victoriously after winning her over. If he remains forgetting the situation, should we also remain like that? If he remains complete and prideful there, should we who are with faults and are suffering, remain quiet? If he remains ignoring the rules, should we also not break the rules? If only we were united with someone whose separation is bearable, we can remain tolerant. Should we not break the rules, and even pursue madal [an act of crying out in public complaining about the beloved person]? Isn’t it said in periya thirumozhi 9.3.9 “namakkE nalam Adhalin” (if it is good for us)? vEdha oliyum – Being heartless, he is hearing the ancient praises. That is, he is hearing about his previous successes. That is, the praises such as in jithanthE sthOthram 1 “jithanthE puNdarikAksha” (Oh lotus-eyed lord! Victory for you). vizhA oliyum – It appears like celebration for winning her over. aRA – Immediately after the thIrththavAri (concluding) day, they will perform thirumuLaichchARRu (commencement of the next uthsavam). Just as akrUra performed aSvamEdha yAgams continuously after acquiring the syamanthka maNi (a precious gemstone), for makaranedunguzhaik kAdhar, there are continuous uthsavams; parAnguSa nAyaki is a sthrI rathnam (gem among women). But the celebrations are not held where she is present [instead they are in thenthiruppEreyil]. piLLaik kuzhA viLaiyAttoliyum aRA – She is saying that she would leave the town where even aged [matured] persons are stopped [from engaging in bhagavath vishayam] and to the town where even young children [who are not matured] are engaged in bhagavath vishayam constantly, are present. Even young children would be immersed in makaranedunguzhaikkAdhan’s beauty and would constantly utter about that as said in SrI rAmAyaNam ayOdhyA kANdam 6.16 “bAlA api krIdamAnA gruha dhvArEshu sangaSa: | rAmAbhishtava samyukthASchakrurEva mitha: kathA: ||” (Children who are in playing-stage will assemble at the entrance and sing about the glories of SrI rAma). uththara rAmAyaNa SlOkam “rAmO rAmO rAma ithi” (Saying rAma, repeatedly) is beautifully explained here by nampiLLai. rAmO rAjyam praSAsathi – The dwellers of ayOdhyA are not enjoying the result of their karma; they are enjoying the mercy of SrI rAma. As said in samkshEpa rAmAyaNam, “nachAgnijam bayam kinchith” – fire never gets hotter than it is necessary to cook rice. “nApsu majjanthi janthava:” – the water which will drown objects, will make them float. Water [ocean] has already seen the prowess of SrI rAma. thiruchchandha viruththam 31 “vElai vEva vil vaLaiththa” (launched his bow to heat the water of the ocean). thiruppEreyil sErvan nAnE – It is natural that the loser reaches the abode of the winner. As said in “thAmaraik kaNNan en nenjinUdE“, she will sing “jithanthE” and fall there [at his divine feet]. This entry was posted in thiruvAimozhi, thiruvAimozhi 7th centum on August 7, 2018 by Sarathy Thothathri.